Parabolic SAR is one of the most popular indicators allowing you to determine in a timely manner the trend reversal, get an early entry point and accurately define the place of profit taking. Parabolic SAR is very efficient in case of a trendy market but often gives false signals during a flat. In order to sort such signals out, it is possible to use the same indicator on higher timeframes. This eliminates the main drawback of the indicator during a flat, while retaining its advantage of early entry in the direction of a trend. 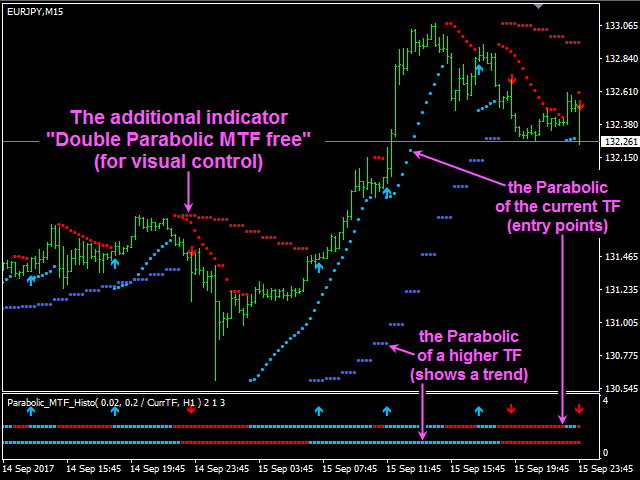 Double Parabolic MTF Histo implements this idea and combines two timeframes on a single Parabolic chart. The higher timeframe Parabolic defines the trend, while the lower timeframe one searches for the market entry point in trend direction. 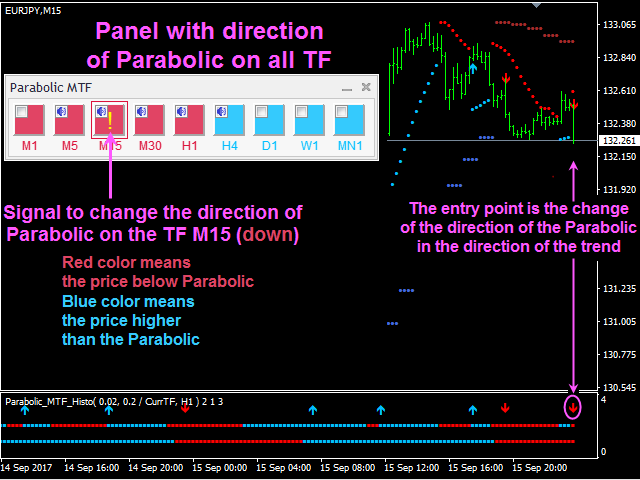 Sorting out most flat movements - a signal is provided only if the directions of Parabolics from two timeframes coincide. 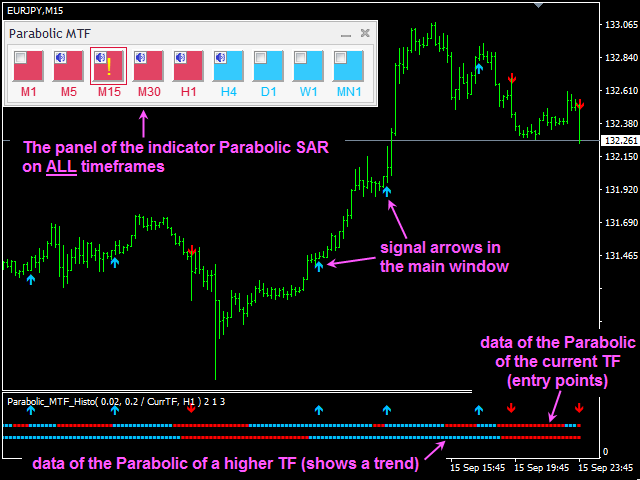 Graphical panel of the Parabolic SAR indicator on ALL timeframes. If Parabolic switches its direction on some timeframe, an exclamation mark is displayed on the panel, accompanied by a text message and audio signal. The messages can be customized separately for each timeframe using the corresponding check boxes. 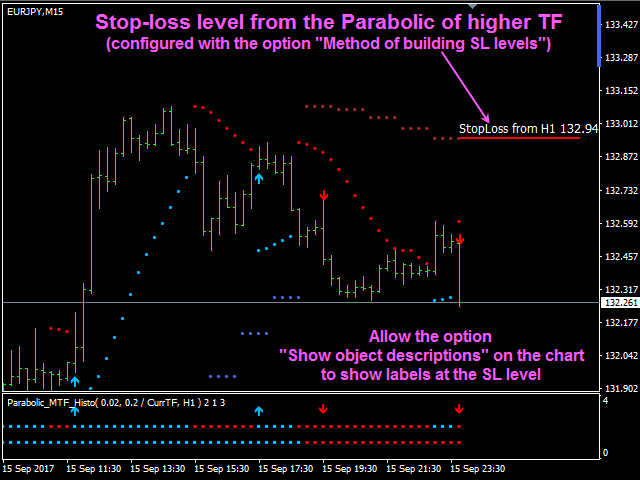 The graphical display of a stop level that shifts by Parabolic 1 or 2 (specified in the settings). (needed for EAs based on Double Parabolic MTF Histo). Information on a signal is displayed in a message box with an audio alert. It also supports sending messages to email and push-messages to mobile devices. 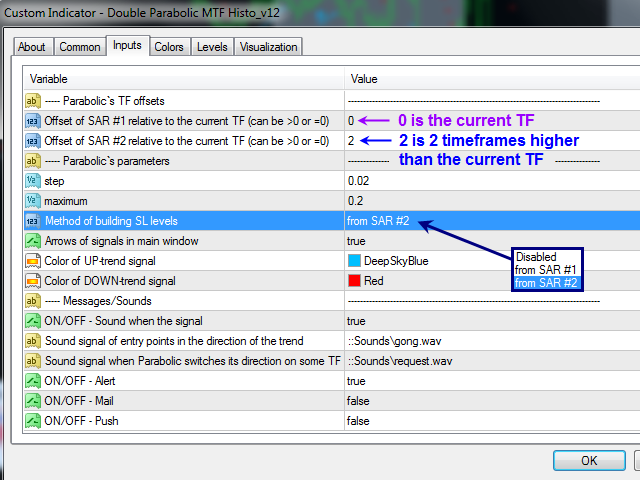 The indicator is located in a separate window, so as not to overload the main chart window. Signal arrows can also be displayed in the main window. 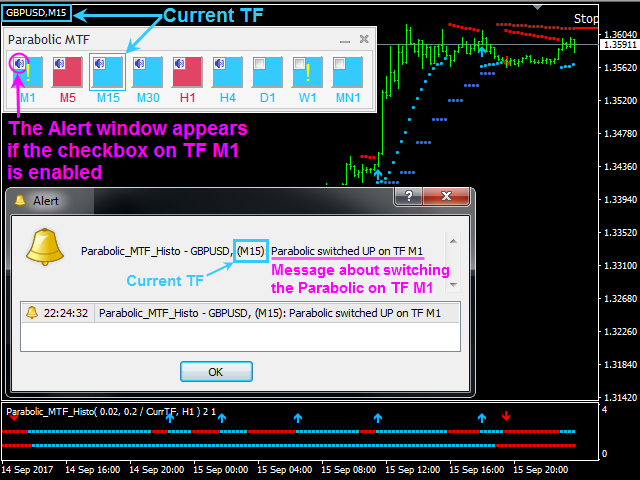 For more convenient indicator management in the main window, use the free Double Parabolic MTF free indicator that displays Parabolic SAR readings from different timeframes on a single chart. ON/OFF - Push - enable/disable sending push notifications to mobile devices. a must have, great addition to my strategy. It is a very good indicator, can filter out many side movement. Added signal about a change in the Parabolic on ALL TF (sound and message). It is enabled for each timeframe individually using the check boxes on the graphical panel.